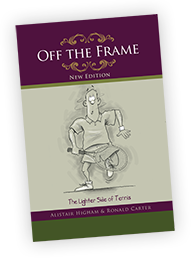 Off The Frame - is an entertaining collection of stories, poems and sketches from the The Lighter Side of Tennis. 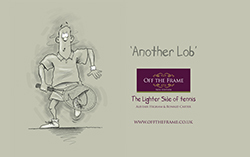 Off The Frame - is an entertaining collection of stories, poems and sketches from the The Lighter Side of club tennis. You are taken into the fictional world of Longshott Tennis Club in Spin Valley where you meet confused beginners, pushy parents, dangerous doubles teams and partially-sighted umpires. You meet e-coaches who don't understand Twitter and international tennis teams, each with a different view of how the game should be played. It is a fictional world but it is one that will be all too familiar wherever you play or watch tennis around the world. "A crazy collection of stories and poems, complemented by wonderfully witty illustrations. 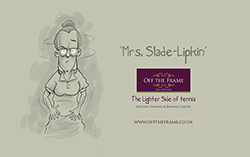 I think everyone involved in tennis will recognise one of the hilarious characters!" 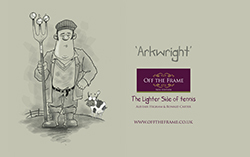 "Off The Frame will appeal to anyone who is involved in the sport of tennis." "If you like tennis... and a good giggle... you'll like this book."